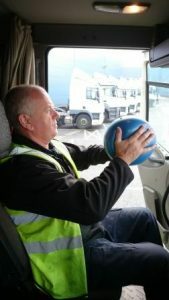 Lorry drivers who take part in the SHIFT programme, which stands for Structured Health Intervention For Truckers, attend a six-hour, interactive education session about healthy eating and physical activity, and are provided with physical activity monitors to track their movement and engage in ‘step count challenges’ with other drivers. They are also given exercise equipment and a workout routine that can be used in their cabs at service stations and other resting places. Dr Veronica Varela-Mato, a Research Associate on the SHIFT Study at Loughborough University’s School of Sport, Exercise and Health Sciences and the National Centre for Sport and Exercise Medicine, led the pilot project. She said: “Lorry drivers are a large, ageing workforce with high risk factors for conditions such as heart disease and type 2 diabetes. This is largely due to their work environment, culture and job demands. 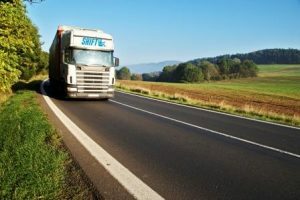 84 per cent of lorry drivers are overweight or obese, 87 per cent are physically inactive and 35 per cent have high blood pressure. Vicki Johnson, a research associate in the Leicester Diabetes Centre at Leicester’s Hospitals, led the application. She said: “I’m thrilled that SHIFT has been shortlisted for this innovation award and can’t wait to attend the awards ceremony to find out whether we have won! The Medipex NHS Innovation Awards seek to identify and celebrate the innovative ideas and people that drive the NHS. It is an opportunity to showcase outstanding projects and initiatives and to provide support to those with real value and potential to improve lives. SHIFT has been shortlisted in the self-management category. This category is for projects that promote healthy lifestyles, increase access to and understanding of key disease indicators, provide educational materials and improve remote access for patients. The awards ceremony to find out who will take home the £2,000 prize to further develop their project will take place at Oulton Hall, Leeds, on Thursday 4 October 2018. The SHIFT study is funded by the National Institute for Health Research (NIHR) Public Health Research Programme and supported by the NIHR Leicester Biomedical Research Centre.